Autumn’s coming. Kill Me Now. Everyone else seems to love it, but I dread autumn. The first brown leaves send a chill down my spine. I’ve already had the season’s first cold (caught in the UK, of course) and now the nights are shortening, filling me with thoughts of the grave. This depression arises for several reasons; partly, it’s the thought of December to April, five months under miserable dark skies, I’ve lost so many people in winter and having been born with weak lungs I always get sick in winter, so I associate January with illness and death. Although Britain has four distinct seasons we don’t celebrate their arrival or departure as they do in Southern Europe. Next week Spain hosts its celebrations marking the end of summer. In Greece the parties move South with the sun, ending in Santorini. In Italy they see in winter and summer with bonfires and fireworks. Here in Barcelona the chiringuitos (beach cafés) close for the season and the wardrobe changes dramatically. Winter dress is quite formal; you never wear shorts, and don jackets and scarves in muted colours, whereas in London it’s common to see people in T-shirts at Christmas, the English believing that if your body isn’t actually frostbitten summer clothing is still acceptable. Autumn brings good stuff too, though; the immense London Film Festival, lots of serious theatre, football, and drowsy lunches with friends passed until early nightfall in gastropubs. The Spanish have a great word for this latter event – sobremesa means to linger on after the food has been eaten. (They also have merendar, to have an afternoon snack). It’s the time I get the most work done, too. I have the new cover rough for ‘The Lonely Hour’ and think it’s the best one yet. I’m currently editing the manuscript, have delivered ‘England’s Finest’ and am preparing to start a new thriller, seeing as ‘Little Boy Found’ appears unlikely to make it into print from its e-book origins. I was equally unhappy about the last short story collection, ‘Frightening’, not becoming a print book, so from now on I’ll only be working on print books – and if I find myself without a deal I’ll crowdfund them. 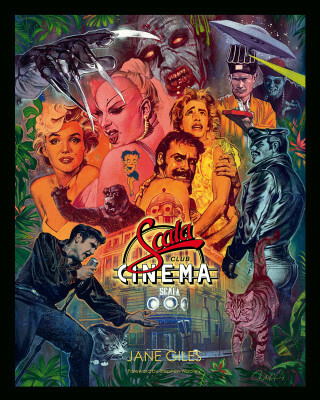 Speaking of which, the former manager of London’s notorious Scala Cinema, Jane Giles, crowdfunded her immense book about the Scala’s history and hit her funding target in record time. The launch takes place at the old Scala Cinema itself, and tickets for the gig, which will feature live bands and clips, can be bought here. I’ve contributed to this delicious book and to ‘The Art of Pulp Horror’, edited by Steve Jones. London is bountiful in the winter months, with much to see and do. The difference is that with Brexit looming prices are massively outstripping wages, so few can afford to make the most of this cornucopia, which is largely aimed at tourists. Luckily in the sprawl of such a city there’s culture to suit all pockets, and deals exist if you know where to look. So it’s not all darkness. Perhaps I’ll look forward to autumn after all. I was once described as having ‘an inappropriately sunny disposition for someone who writes about murderous deeds.’ Frankly, I would have thought it was exactly what’s needed. Starbucks Venti americano is £3 in London and €4 in Frankfurt. Dont complain too much about London prices, London is still chesper than the competition!!! You aren’t the only one, we all have colds here too. I get depressed about winter also , its the worst time of year for me too. All this talk about ‘flu shots, and how many people died last year; . I never get one because every time I have had one; I am really sick right away and seems continuous through to the summer. A few years back in Sofia, no Starbucks, but there was a Costa Coffee, not particularly cheap if I remember correctly, and yes lousy coffee. Well I’ve almost got over a dose of flu, it was a bad one – more of a man mountain flu. I like all seasons, I tend to like spring and autumn most even though I tend to be illest then, cold and flu. But I feel both are times of change and happily not of extreme weather. A time to prepare. Cheers for concentrating on print books. Cheers, I say! If it’s any comfort, I heard recently that you get fewer colds as you age because you gradually develop immunity to all the various forms the nasty thing takes. I think I even believe that. Britain has many change of season festivals Mr. F.
From Halloween, Bonfire Night, Armistice day (St Martin’s day during Blood month) , Xmas, Plough Sunday, Candlemass, Easter, Mayday and summer solstice (now mixed up with Glastonbury festival). Our festivals have been claimed by church and state + often renamed and repurposed but they are still there the old Pagan festivals. Solstices and quarter days marking the years wheel turning. And stop being such a grump. I hate autumn too. The harbinger of darkness and miserable weather. I also hate that bloody song “all the leaves are brown and the sky is grey…” Roll on the spring. I thought it was the season of mists and mellow fruitfulness. Out in ‘t woods the leaves turn colour and the air is tinted with woodsmoke and bonfires. Whatever happened to Smokeless Zones? Up here in Newcastle we don our autumn flip-flops, bare our chests and scream defiance at the waning sun – or at least the women do. The problem with summer is that people start smiling, which aches the cheek muscles of us northerners. I remember one summer a Yorkshireman actually nodded to me in the street and said ‘hello’. I wrote it down in my diary and considered a letter to the Times. What’s all this about coffee? 105 degree muggy weather begone! Welcome cashmere socks, long walks, good soups, hot cider. In Nottingham there’s a horror film festival called Mayhem. There’s some good films from the looks of it. I long every year for autumn to come. Of course, if you suffered through August in the smothering heat and humidity of Florida, you might too. I listen enviously to people on BBC Radio 2 talking about switching on the heat as the temperature here hits 95F in mid September. Just finished reading ‘wild chamber’..loved every minute of it..and laughed through all the dark comedy. I think darker days and longer nights make many of us maudlin. This book cheered me up. I love Autumn. The heat of summer makes me feel very ill indeed, and, as I work at night, it’s difficult to sleep properly in the daytime. In Autumn, you can start wearing proper clothes again, and all the people who think 3/4 length trousers are smart, but don’t realise that most of them look like squat trolls wearing them, disappear from the streets. The haven’t-a-bloody-clue seasonal cyclists put their machines away for another year, making the roads considerably safer for everyone else. And I get the moleskins and jumpers out again, and look forwards to proper autumnal food, preferably in an old pub with a roaring fire. Perfect. Well, here in Phoenix we’re giddy when the temps fall below 100°F. The heat doesn’t really break until mid-November. As a born New Englander, I get surly when I hear complaints about rain (we just broke the 3 inch mark for the year!). Trade with you anytime, CF! 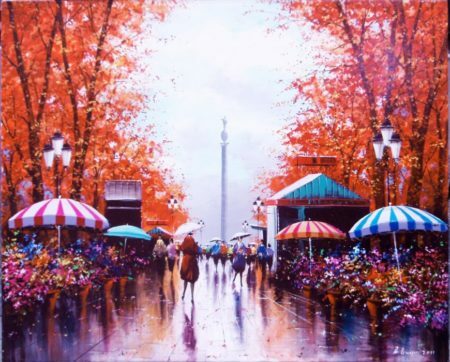 We always envied eastern Canada where they had crisp fall days and colourful leaves contrasting with deep blue skies because we had grey skies and pouring rain to get us into a serious mood appropriate to the return to school. The last few years we’ve had those eastern autumns but with warm temperatures. This year we had rain that revived the trees in time for them to turn colour. The husband came home today from five weeks recovering from his broken thigh bone and is enjoying the sunshine and last night’s harvest moon. Now we have to investigate the case of MRSA he appears to have contracted somewhere along the line. The Vancouver international Film Festival is going on, the fringe festival was on, there was a music festival in Stanley Park and, yes, it’s time for flu shots (a preventative in advance of nasty winter weather). Cheer up, Chris.